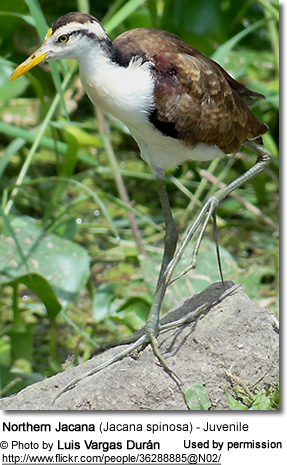 The Northern Jacanas (Jacana spinosa) are wetland birds with a range that stretches from southern USA south to Central America. 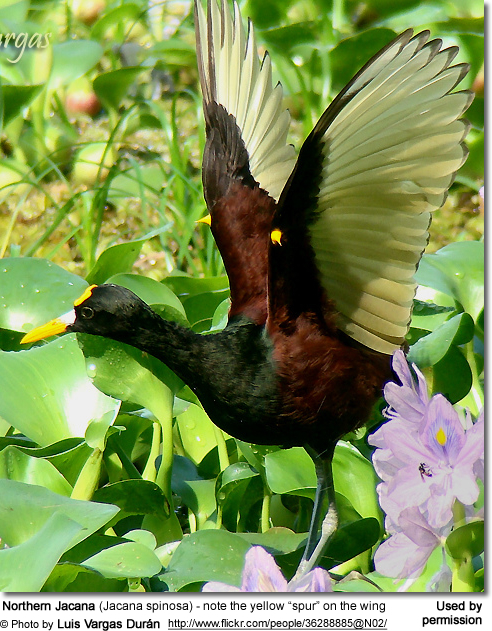 They are known by a variety of names, including American or Middle American Jacanas, Mexican Jaçanas or, simply, Jaçanas. 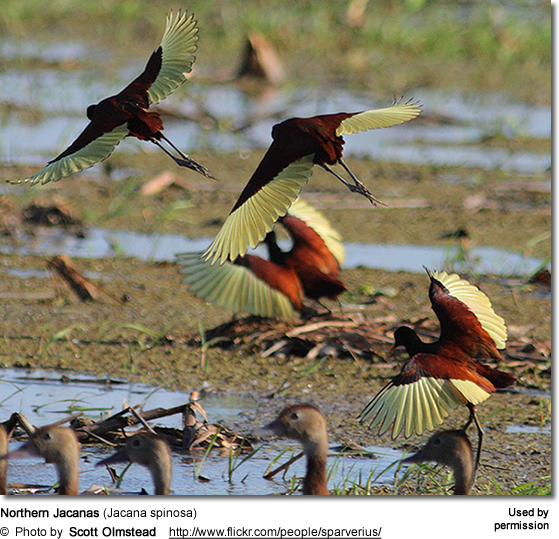 Jacanas spend a good part of their days on floating vegetation as they feed on insects on the surface of vegetation and the ovules of water lilies. In Jamaica, these medium-sized waders are commonly referred to as "Jesus Birds" based on their habit of walking on floating vegetation in shallow waters, giving them the appearance to walk on water. For this same reason, these birds have also been nick-named "lily trotters". long, slender toes that spread out to cover an area of 4.7 - 5.5 inches (12 - 14 cm) thus dispersing the weight over a large area. Another peculiar aspect of this species is that the dominant female is polyandrous (mates with several males) - and she is often referred to as "the prostitute bird." She is also not the primary care takers of the young. The male incubates the eggs, and feeds and protects the young. Northern Jacanas are distributed from southern Texas south through coastal Mexico - along the Gulf slope from Tamaulipas on Gulf of California to Yucatan and on the Pacific slope from Sinaloa to the south - to western Panama. They are also found on the islands of Cuba, Jamaica and Hispaniola and the West Indies. Vagrants have been reported in Arizona. 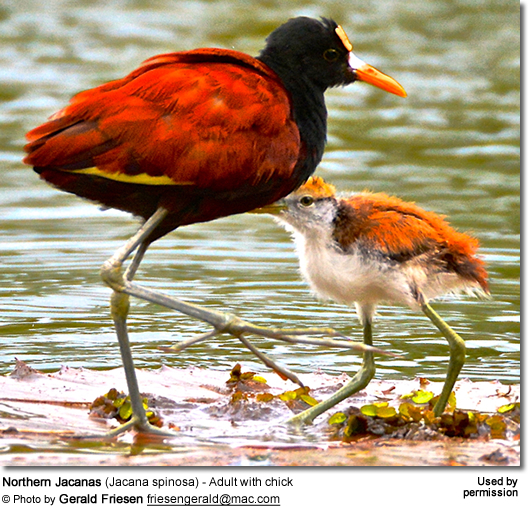 Jacanas are resident (non-migratory) within their range and maintain home territories for feeding and breeding. They aggressively defend their territories using as weapons the spurs on the bend of the wing. The three are very similar in appearance. Range: Mexico, from south central Sinaloa and central Tamaulipas south to Chiapas, the Yucatán Peninsula and the island of Cozumel. A small number of them are found in southeastern Texas. Length: 6.7 - 9.4 inches or 17 - 24 cm. The larger females are about twice as big as males. White supercilium ("eye brows") and white lores (feathers covering the ears). Frontal shield reduced or absent. 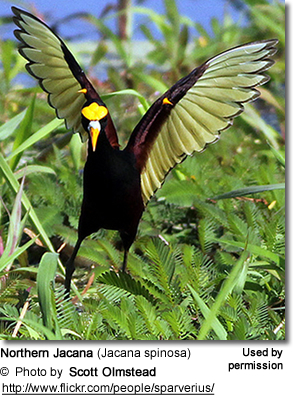 This species is very similar to the Wattled Jacana, Jacana spinosa, with which it overlaps in Panama, and was formerly considered conspecific with that form (of, or belonging to, the same species). The Wattled can be identified by its red frontal shield and a reddish rictal wattle. 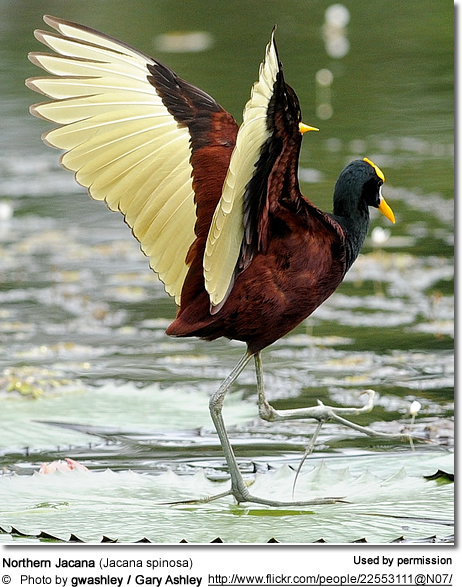 They also lack the slight brownish tint to the belly plumage of Northern Jacana. Immature birds are more difficult to identify as they basically look alike; and the only distinction is the shape of the frontal shield. They feed on insects, other invertebrates and seeds picked from the floating vegetation or the surface of water. They also turn over aquatic plants as they search for insects hiding underneath. Also feed on flowers and small fish. Breeding Season: May breed throughout the year (as long as water levels are constant); but most breeding is observed at the start of the rainy season, which varies throughout the range. Mating System: Females mate with up to four males during the reproductive season. Males may mate with other females, when new females come into their area; however, in most cases females will hold and protect their territories against other females. The male takes care of the nest and the chicks, whilst the female guards her territory and the males in it. Average number of eggs in a clutch: 3 - 5 (average 4). Protective "dads" are known to carry their chicks under their wings to safety when danger approaches. The female may assist in protecting the nest. If the conditions are favorable, the female may get started on a new clutch, when the chicks are 12��16 weeks old. Their vocalizations are described as " harsh ��jik�� calls that progressively speed up to a chatter; and a whistling gnashed cui cui cuic cui cui.